Welcome to the premier source for Custom AR parts. We are fans, shooters, craftsmen, and most of all perfectionists. We strive to supply you with the best custom parts available anywhere in the world. We use state of the art lasers combined with our years of experience to make sure the parts we create for you are a work of art on their own. Every part we create must be good enough to go on our guns, or we won't ship it, guaranteed! 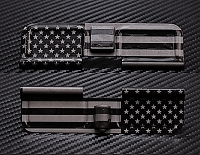 We started with custom ar dust covers, and decided that wasn't enough, and went on to do charging handles, magazines, pmags, and more. Need your gun engraved? Not a problem, we have an FFL, so shoot us a message, we also engrave firearms (NFA/SBR Engraving as well!). Whatever you can imagine, we can create, so let our expert team truly make your rifle a stand out piece.